From Hiroshima to the Iceman: The Development and Applications of Accelerator Mass Spectrometry presents a fascinating account of a breakthrough in science and the insights it has brought that would not have been possible without it. Involved since its invention, Harry Gove recounts the story of the development of accelerator mass spectrometry and its use as an ultrasensitive detection technique in many fields of science and the arts. A key advantage of the technique is that it requires only very small samples of material. 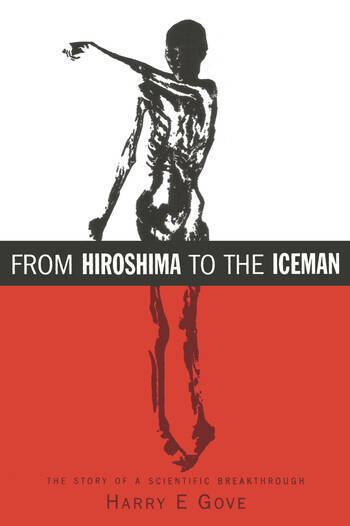 The book explores the areas where the technique has increased understanding and provided solutions to problems, including the clean-up and storage of nuclear waste, the effects of the atomic bombing of Hiroshima, biomedical research, the settling of the Americas, and carbon dating of many precious artifacts. Objects dated include the Turin Shroud, the Iceman, the elephant bird egg, and the Dead Sea scrolls. "This is a fascinating account of a major particle accelerator application success by an enthusiastic scientist who played a major role in its development." "Harry Gove's excellent book … presents the definitive history of the use of tandem electrostatic accelerators in accelerator mass spectrometry as well as the wide variety of applications of this new technique. … Quite apart from the description of techniques and technology, the book provides a wealth of fascinating insights into a broad range of both the physical and social sciences; it is the perfect book for a long plane trip and, of course, for anyone either working in or interested in accelerator mass spectrometry." "It is a fascinating book because in every sentence one feels the passionate involvement of the author. Gove describes AMS in a similar fashion. His book is full of his personal experiences, including details about what people said, and did, or did not do. He does not try to be objective. …What one learns is something else, perhaps equally-if not more-important than a cool description of AMS from a purely scientific book: it is a beautiful but necessarily biased view of how the development of AMS happened with real people. Along the way, one learns about the basics of the technological development of AMS, and about some of the more interesting-if not to say recondite-applications."